There is a boom in the realm of conifer literature in recent years and this book is among the major contributions to "conifer science". The increasing interest towards conifers is nurtured by exciting new discoveries, the recognition of a greater need for their conservation, and their benefits and usage in many arenas of human life. And as stated in a personal note by the authors, "if botany is "scientia amabilis"—the "amiable science"—then, for us, the study of conifers is "scientia amabilissima"—the "most amiable science."" Conifers include approximately 625–700 species worldwide and up to 1000 taxa including distinctive subspecies and varieties, compared with an estimated 250,000 species of flowering plants, but conifers are much more important to the world's landscape and ecology than their relatively small number of species might suggest. Conifers have their own unique appearance, especially when compared with broad-leaved trees. Enthusiasts and collectors around the world have provided a huge niche for them among cultivated plants, and the unparalleled beauty of many conifers—especially cypresses, cedars, firs, and spruces—enhances innumerable landscapes, both public and private. Anyone looking for something uncommon to complement a plant collection can choose from an extraordinary variety of conifers ranging from the magnificence of giant sequoias, cedars, and golden larches to the innumerable shapes and sizes of dwarf and slow-growing species and varieties. Conifers, nearly all of which are evergreen, also offer a delightfully refreshing contrast in a winter landscape. This is especially true in temperate zones, where deciduous trees usually prevail. By providing a spectacle throughout the year, conifers are notable compared with trees that spend half the year leafless. Why conifers?... Driven by competition from broad-leaved trees into regions where there is little competing vegetation, in nature most conifers inhabit cold, dry, and austere places that are inhospitable to humankind: the endless taiga, vast expanses of high-mountain and subalpine forests, steep mountain cliffs, the periphery of deserts, and seemingly boundless marshlands. Because conifers generally occur in such unfavorable places, it is no surprise that they are often invoked as symbols of wild, primeval nature. This book is a tribute to these beautiful plants. And the team that prepared this book pays tribute to all – the Benefactor, the late Mr. Walter Hunnewell, as well as the great number of supporters, foundations, volunteers, field guides and many others – who helped to create it. One time donation? Recurring? Click donate to select the amount and term. "He tells me that they were in excellent condition, and that they seemed beautiful. With many thanks for all your help and attention." "I am delighted with the books. A fantastic effort and a marvellous way to explore the trees of the world. I was a little surprised there were no conifers in Madagascar having recently visited the island, but this is explained. Terrific book!" 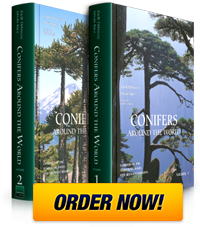 "We have now received Conifers Around the World vols 1 - 2. Thank you so much for ... having the authors provide their signatures. What beautifully presented books - they will be of great pride in our library." This magazine is the premier source for reviews of academic books, electronic media, and internet resources for more than 35,000 librarians, faculty members, and key decision makers. Copyright © 2019, International Dendrological Foundation. .:| TERMS & CONDITIONS | IMPRESSUM | DONATIONS | AFFILIATE PROGRAM |:.